The Basel Committee of Banking Supervision sets out expectations for public disclosure of a bank’s risk management objectives and policies, reporting systems, and definitions to be published annually. General Bank of Canada operates two lines of business: fixed rate indirect auto financing and commercial lending; funding its operations through the issuance of fixed rate Guaranteed Investment Certificates with terms up to 5 years. The Bank’s treasury function is kept intentionally straight forward, with asset and liability maturity bands constantly monitored and matched within self-imposed limits. All financial assets and liabilities are fully disclosed on the Bank’s balance sheet. The bank has no subsidiaries, and all operations are conducted in Canada. The Bank has a robust and effective system of controls to assess and manage risk across various spectra, including credit risk, interest rate risk, liquidity risk, market risk, and operational (including regulatory) risk. The Bank endeavors to satisfy all regulatory disclosure requirements, without disclosing excessive / unnecessary information, in consideration of the Bank’s lines of business and any potential competitive disadvantage that could arise from disclosure. Capital and leverage ratios were calculated using the Basel III framework. Regulatory capital includes Common Equity Tier 1 (CET1), additional Tier 1 and Tier 2 capital. CET1 capital mainly consists of common shares, retained earnings and other components of equity. Tier 1 capital comprises predominantly CET1, with additional items that consist of capital instruments such as certain preferred shares. Tier 2 capital includes subordinated debentures that meet certain criteria and certain loan loss allowances. Total Capital is the sum of CET1, additional Tier 1 and Tier 2 capital. Regulatory adjustments under Basel III include full deductions of intangibles, certain deferred tax assets, and non-significant investments in banking, financial and insurance entities. Regulatory capital ratios are calculated by dividing capital by risk-weighted assets. 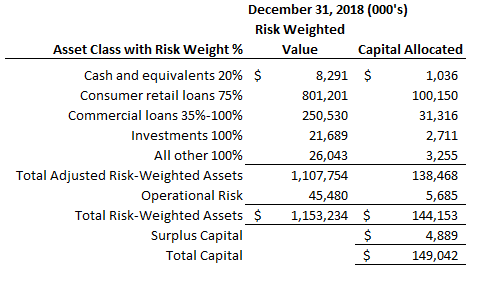 The Bank’s assets, by classes, are risk weighted, with additional consideration given to the Bank’s operational risk, relying on the Basic Indicator Approach to quantify operational risk. OSFI provides two approaches to determining credit risk, those being the Standardized Approach versus the Internal Ratings Based Approach, with the Bank following the former. OSFI formally establishes risk-based capital targets for deposit-taking institutions in Canada. These targets are currently a Tier 1 ratio of greater than or equal to 7%, and a Total capital ratio of greater than or equal to 10.5%. In addition, Canadian banks are required to ensure that their leverage ratio, which is calculated by dividing Total capital by Total assets, does not fall below a minimum, as prescribed by OSFI for each bank individually. The Bank prepares a three year capital plan each year. During 2018 and 2017 we have complied with all capital requirements imposed by OSFI. General Bank of Canada is privately held, and issues only one class of capital to a private shareholder, and as such any further disclosure of the terms and conditions of all capital instruments is not relevant. With the implementation of revised guidelines (Basel III) certain classes of capital will be phased out, and/or renamed. The net effect of Basel III on the bank’s capital management will be minimal. 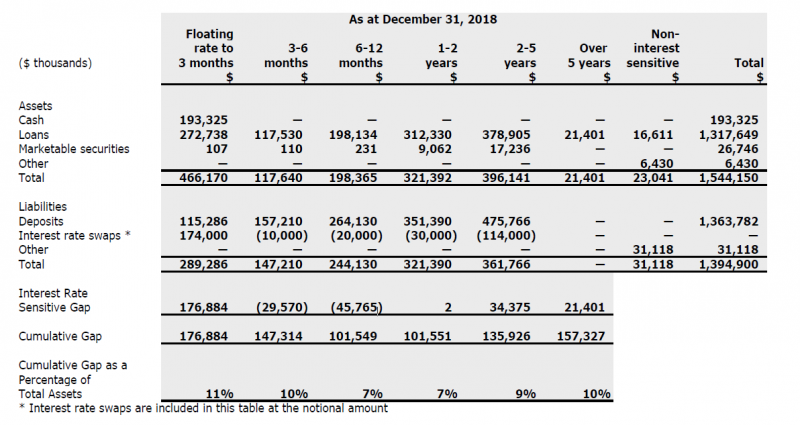 As a non domestically systemically important bank, General Bank of Canada is required to disclose a modified version of its capital and leverage structure as detailed below. Effective risk management plays an essential role in the Bank’s ability to remain financially sound and responsible through the identification, assessment, management and monitoring of all applicable types of risk. The Bank is primarily exposed to credit, liquidity, interest rate and operational types of risk. Senior management is responsible for defining the framework for identifying risks and developing the appropriate risk management policies. The Board of Directors, both directly or through its committees, reviews and approves key policies, and implements specific reporting procedures to enable them to monitor compliance over significant areas of risk. Credit risk is the risk that a financial loss will be incurred as a result of the failure of a customer to honour their contractual commitment or obligation to the Bank. The Bank has developed a Risk Appetite Statement, tailoring our risk position on a case-by-case basis as new opportunities are considered by the Bank. To help mitigate credit risk on the retail loan portfolio, the Bank has established a maximum retail loan amount limit of $150,000, based on credit quality, amount to finance, and lending parameters that clearly define the type, nature and qualification requirements of a prospective debtor. Any loan approvals falling outside of the Bank’s established lending parameters require the post concurrence of senior management. A standardized credit risk rating classification guideline is used to monitor the ongoing quality of the loan portfolio upon initial approval, renewal, or when information becomes available indicating a material adverse change in the customers’ financial affairs. Loans that have fallen more than 45 days into arrears are brought to the attention of a senior credit manager to facilitate the early recognition of problem accounts and implementation of the steps necessary to secure the Bank’s interest in the loan collateral. For commercial lending, the Bank has established a large exposure limit equal to 12.5% of capital, and a credit risk policy that has established targets for portfolio concentration and diversification by asset type and geography, and a risk rating system to monitor the quality of each loan at inception and during its life. All loan applications up to $5.0 million are subject to approval by a senior management committee, up to $10.0 million by the Asset and Liability committee, and up to the large exposure limit by the full Board of Directors. The size and nature of the portfolio is such that each loan receives ongoing management attention to monitor performance and any change in the conditions affecting the security value or operating environment of the borrower. The credit risk related to the Bank’s preferred shares is that an issuer experiences financial difficulties and is unable to pay its preferred share obligations as they come due. To help mitigate this risk the Bank has purchased preferred shares rated as P-3 or better. Liquidity risk is the risk that there will be insufficient cash to meet the Bank’s obligations as they come due. This risk can occur from both fluctuations in cash flows from lending, deposit taking and investment activities. Effective liquidity management ensures that an adequate amount of cash is available to honour all existing and short term cash outflow obligations. The Bank’s liquidity policy includes the ongoing measurement and forecast of cash flows, the maintenance of a pool of high quality liquid assets, and the monitoring of the Bank’s loan portfolio diversification as to geographic concentration. The Bank matches its asset and liability maturities so that assets reprice and liabilities mature at approximately the same time. Market risk is the impact on earnings resulting from changes in financial market variables, such as interest rates and foreign exchange rates. Market risk arises when making loans, taking deposits, and making investments. The Bank does not undertake trading activities and therefore does not have risk related to activities such as market making, arbitrage or proprietary trading. The Bank does not hold or trade in foreign currencies, and consequently is not exposed to foreign exchange risk. The Bank’s material market risk is confined to interest rates, as discussed below. Interest rate risk is the impact on net interest income, both current and future, resulting from a change in market interest rates. This risk and potential variability in earnings arises primarily when cash flows stemming from interest sensitive assets and liabilities have different repricing dates. A positive gap arises when interest sensitive assets exceed interest sensitive liabilities for a specific maturity or when interest sensitive assets reprice earlier than interest sensitive liabilities. A negative gap arises when the opposite occurs. The impact of a change in market interest rates on earnings will depend on the magnitude of the change, on the size and maturity structure of the cumulative interest rate gap position and the management of those positions over time. To mitigate the risk of changing interest rates with respect to variable rate commercial loans funded predominantly with fixed rate deposits, the Bank has entered into interest rate swaps. Operational risk is the potential for loss resulting from some external event, human error or inadequacy or failure of processes, procedures or controls. Operational risk can affect the Bank’s financial position, reputation, competitive position, and regulatory position. The Bank is exposed to operational risk from internal business processes and activities as well as from activities that are outsourced. The financial measure of operational risk is actual losses incurred. There was no material operational risk losses incurred during the year ended December 31, 2017. The Bank mitigates operational risk by implementing policies and procedure directed at identified risks, employing knowledgeable and experienced senior managers, segregating duties among employees, training all employees with respect to effective risk management, and continually reviewing and upgrading policies and procedures. Exposure to single borrowers is limited by policy to $150,000 in the case of retail automotive loans, and to 12.5% of capital for any non-retail automotive credit exposure. Geographically, the bank’s loan book is distributed 34% in British Columbia, 23% in Alberta, 9% in Saskatchewan, 8% in Manitoba, and 26% in Ontario. The Bank’s senior management personnel include all directors, and executive management (President, Vice President, Chief Operating Officer, Chief Financial Officer, and Chief Anti-Money Laundering Officer). The bank does not have a separate remuneration committee, nor does it have the resources to implement a functional deferral and performance adjustment scheme. The Chief Operating Officer is paid a base salary by the bank, plus an annual amount directly by the shareholder, based on criteria established by the shareholder from time to time, commensurate with the shareholders expectations and appetite for return and risk. The payment of the annual bonus to the Chief Operating Officer is not paid by the Bank, therefore its composition is immaterial to parties other than the sole shareholder. The total compensation for the Chief Operating Officer is however aligned roughly with a regional executive position for larger financial institutions. The Chief Financial Officer is paid a base salary based on published data from leading Canadian recruitment firms. The President, Vice President and Chief Anti Money Laundering Officer are allocated notional amounts roughly equivalent to the pro-rated time they serve in these positions relative to other duties they perform for related companies. Their compensation is paid by entities other than the Bank. Unaffiliated Directors are paid an annual retainer plus a stipend for each meeting they attend.